1. Horses should have their teeth examined by someone skilled in equine veterinary at least once every two years after they hit age two. Older horses may benefit from yearly examinations because they are more prone to problems. 2. A horse’s teeth must be flat on top so they can chew their food thoroughly. If its food is not well chewed, the horse cannot digest the food and may not be receiving sufficient nutrition, as a result. 3. Taking care of equine dental problems is important for lots of reasons, including reducing the horse’s pain. If her teeth have not been well cared for, they can become sharp and painful inside her mouth. 4. Both horses and people can suffer from a condition known as temporal mandibular joint problems. This occurs when the horse’s molars are not properly aligned. TMJ conditions can be extremely painful and can even cause your horse to stop eating. 5. You should regularly use an equine dental float to keep your horse’s teeth filed down flat. If you don’t feel comfortable doing this yourself, you can hire someone who has the necessary equine dental equipment. 6. Signs of equine dentistry problems can be identified by checking your horse’s manure. If you find pieces of undigested food in the stool that’s a good sign she is having problems chewing and needs to get dental care promptly. 7. Your regular vet may not be the best person to call if your horse needs dental care. 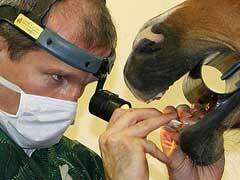 Instead, contact the closest equine dental schools and ask for a referral. They may be able to connect you with someone experienced in equine dentistry. When it comes to equine dentistry, your horse needs you to take dental health seriously. If her mouth is in good condition, she’s going to be much happier.